Liz knows firsthand the transformative power of travel. After her first visit to Africa, Liz fell in love with the continent and the people. As a result, she left the world of advertising in 2003 and created her own sales & marketing company, The Archer Group Inc., to promote eco adventure lodges, camps, and destinations. Liz brings 20 years in marketing communications, with a proven record in customer focused marketing and a thorough understanding of multiple disciplines within the marketing industry. Liz believes that travel has the potential to change the world by teaching compassion, humanity and acceptance. Before starting The Archer Group Inc., Liz was most recently a Group Account Director with FCB Direct Canada where she was the team leader in the acquisition of new business for the agency (Direct Energy Essential Home Services, Ontario Tourism, Export Development Canada, SC Johnson, Hilton International and Japan Tobacco International). She oversaw the multi-channel integrated launch of Talk Broadband for Primus Canada, managed the launch of SC Johnson’s first CRM program as well as developing the international travel agent program for Hilton International. Prior to joining FCB Direct Canada, Liz was an Account Director at MacLaren McCann Relationship Marketing where she managed the launch of the first CRM program for General Motors of Canada and managed the Toronto Dominion Bank, CitiFinancial Canada and Metropolitan Hotel businesses as Account Director at mosaic direct. Liz has been a Senior Judge for the Canadian Marketing Association RSVP awards, a member of the Direct Mail Council and the Chair of the Canadian Marketing Association Conference. Liz loves travel and has traveled solo around the world visiting Africa, Asia, Australia, New Zealand, Oceania and South America. 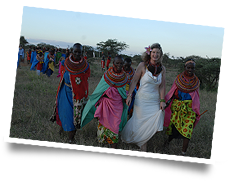 However, of all the places she has visited her favourite is still Kenya where she was married in a 3 day traditional Samburu blessing ceremony.